"Conrad V" redirects here. For the duke of Silesia, see Konrad V Kantner. Conrad (25 March 1252 – 29 October 1268), called the Younger or the Boy, but usually known by the diminutive Conradin (German: Konradin, Italian: Corradino), was the Duke of Swabia (1254–1268, as Conrad IV), King of Jerusalem (1254–1268, as Conrad III), and King of Sicily (1254–1258, de jure until 1268, as Conrad II). Conradin was born in Wolfstein, Bavaria, to Conrad IV of Germany and Elisabeth of Bavaria. He is sometimes known as Conrad V of Germany. Though he never succeeded his father in Germany, he was recognized as king of the Germans, Sicily, and Jerusalem by German supporters of the Hohenstaufens in 1254. Having lost his father in 1254, he grew up at the court of his uncle and guardian, Louis II, Duke of Bavaria. His guardians were able to hold Swabia for him. Jerusalem was held by a relative from the royal house of Cyprus as regent. In Sicily, his father's half-brother Manfred continued as regent, but began to develop plans to usurp the kingship. Little is known of his appearance and character except that he was as "beautiful as Absalom, and spoke good Latin". Although his father had entrusted him to the guardianship of the church, Pope Innocent IV pursued Conradin with the same relentless hatred he had for his grandfather Frederick II, and attempted to bestow the kingdom of Sicily on a foreign prince. Innocent's successor, Pope Alexander IV, continuing this policy, offered the Hohenstaufen lands in Germany to King Alfonso X of Castile and forbade Conradin's election as king of the Romans. Having assumed the title of King of Jerusalem and Sicily, Conradin took possession of the Duchy of Swabia in 1262, and remained for some time in his duchy. 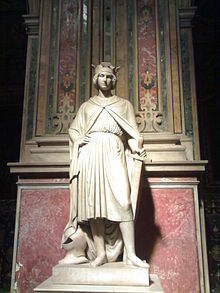 Conradin's first invitation to Italy came from the Guelphs of Florence: they asked him to take arms against Manfred, who had been crowned king of Sicily in 1258 on a false rumor of Conradin's death. Louis refused this invitation on his nephew's behalf. In 1266 the count Charles I of Anjou, called by the new pope Clement IV, defeated and killed Manfred at Benevento, taking possession of southern Italy: envoys from the Ghibelline cities went then to Bavaria and urged Conradin to come and free Italy. Count Guido de Montefeltro representing Henry of Castile, Senator of Rome, offered him the support of the eternal city. Pledging his lands, Conradin crossed the Alps and issued a manifesto at Verona setting forth his claim on Sicily. Notwithstanding the defection of his uncle Louis and of other companions who returned to Germany, the threats of Clement IV, and a lack of funds, his cause seemed to prosper. Proclaiming him King of Sicily, his partisans, among them Prince Henry of Castile, both in the north and south of Italy took up arms; Rome received his envoy with enthusiasm; and the young king himself received welcomes at Pavia, Pisa and Siena. In September 1267 a Spanish fleet under Frederick of Castile, and a number of knights from Pisa, and Spanish knights soldiering from Tunis, disembarked in the Sicilian city of Sciacca, and most of the island rebelled against the Angevin rule. Only Palermo and Messina remained loyal to Charles. The revolt spread to Calabria and Apulia. In November of the same year the Church excommunicated him; but his fleet won a victory over that of Charles I of Anjou; and in July 1268, Conradin himself entered with immense enthusiasm in Rome. Having strengthened his forces, he marched towards Lucera to join the Saracen troops settled there since the time of his grandfather. On 23 August 1268 his multi-national army of Italian, Spanish, Roman, Arab and German troops encountered that of Charles at Tagliacozzo, in a hilly area of central Italy. The eagerness of Conradin's Spanish knights under Infante Henry of Castile in the most successful first charge, and the error of obtaining plunder in the enemy's camp after that momentary victorious assault gave the final victory to the reinforced French. Escaping from the field of battle, Conradin reached Rome, but acting on advice to leave the city he proceeded to Astura in an attempt to sail for Sicily: but here he was arrested and handed over to Charles, who imprisoned him in the Castel dell'Ovo in Naples, together with the inseparable Frederick of Baden. He was tried as a traitor, and on 29 October 1268 he and Frederick were beheaded. With Conradin's death at 16, the legitimate Hohenstaufen line became extinct. His remains, with those of Frederick of Baden, lie in the church of the monastery of Our Lady of Mt. Carmel at Naples, founded by his mother for the good of his soul; and here in 1847 Maximilian, crown prince of Bavaria, erected a marble statue by Bertel Thorvaldsen to his memory. 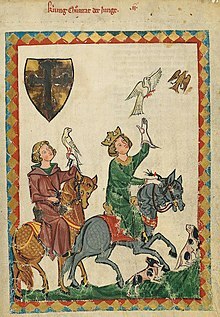 In the 14th-century Codex Manesse, a collection of medieval German lyrics, preserved at Heidelberg, there appear two songs written by Conradin, and his fate has formed the subject of several dramas. His hereditary Kingdom of Jerusalem passed to the heirs of his great-great-grandmother Isabella I of Jerusalem, among whom a succession dispute arose. The senior heir in primogeniture was Hugh of Brienne, a second cousin of Conradin's father, but another second cousin Hugh III of Cyprus already held the office of regent and managed to keep the kingdom as Hugh I of Jerusalem. Conradin's grandmother's first cousin Mary of Antioch also staked her claim on basis of proximity of blood, which she later sold to Conradin's executioner Charles of Anjou. The general heiress of his Kingdom of Sicily and the Duchy of Swabia was his aunt Margaret, half-sister of his father Conrad IV (the youngest but only surviving child of Frederick II and his third wife, Isabella of England) and married with Albert, Landgrave of Thuringia since 1255. Their son Frederick claimed Sicily and Swabia on her right. However, these claims met with little favor. Swabia, pawned by Conradin before his last expedition, was disintegrating as a territorial unit. He went unrecognized in Outremer, and Charles of Anjou was deeply entrenched in power in Southern Italy. Margrave Frederick proposed an invasion of Italy in 1269, and attracted some support from the Lombard Ghibellines, but his plans were never carried out, and he played no further part in Italian affairs. Finally, Sicily passed to Charles of Anjou, but the Sicilian Vespers in 1282 resulted in dual claims on the Kingdom; the Aragonese heirs of Manfred retaining the island of Sicily and the Angevin party retaining the southern part of Italy, popularly called the Kingdom of Naples. The novel Põlev lipp (The Burning Banner) by Karl Ristikivi (1961; in Estonian) depicts Conradin's Italian campaign. A translation into the French by Jean Pascal Ollivry, entitled L'étendard en flammes, was published in Paris in 2005. ^ a b c d e f g h One or more of the preceding sentences incorporates text from a publication now in the public domain: Chisholm, Hugh, ed. (1911). "Conradin" . Encyclopædia Britannica. 6 (11th ed.). Cambridge University Press. pp. 968–969. ^ Karl Ristikivi. L'étendard en flammes. Traduit de l'estonien par Jean Pascal Ollivry. Paris: Alvik, 2005. This article incorporates text from a publication now in the public domain: Wood, James, ed. (1907). "Conradin" . The Nuttall Encyclopædia. London and New York: Frederick Warne. Wikimedia Commons has media related to Conradin of Sicily.